We may have to pause, draw a deep breath and then transform the way we cast out our most-cherished votes for candidates. I don't want your esteemed self to vote for P. U. because he's the most admirable, or the most charismatic, or have the flashiest outfit or the coolest gait. I don't want you to vote for him because he shook your hands at dinners or took a snapshot with you at an event, or because he's the guy you'd most like to have a tea with. I don't want you to vote for him because of some loud media type online, on print, television or radio told you to vote for him. I don't want you to vote for him because some "expert" tell you he's blazing the trail. flowery speech alone about the plight and welfare of young lawyers. Details are easily accessible on the daily reflections and manifestos. And I most especially i don't want you to vote for P. U. because you're voting against the other candidate. Beyond all that, I have the sincere pleasure to present here a gentleman who is honoured in owning up to his words; his excellence, articulation and records are unmatched. Here is a man with professionalism, courage, competence and foresight. I am fully convinced that he would deliver on all his promises. 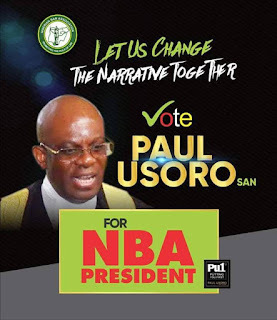 Let us raise the bar towards excellence by voting for Paul Usoro SAN.